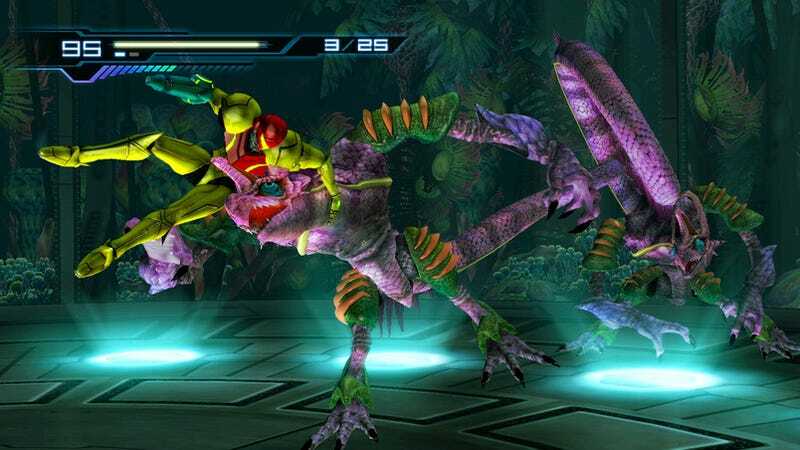 Nintendo: Other M Will be A "Metroid Unlike Anything Ever Experienced Before"
Two of the men leading the new Metroid Wii game told Kotaku about their narrative ambitions for the 2010 sequel Metroid Other M and explained why the Metroid Prime team isn't involved. Yoshio Sakamoto, Nintendo's long-time developer of 2D Metroids, and Yousuke Hayashi, head of Tecmo's Team Ninja, wouldn't tell me and Brian Crecente how Metroid Other M controls. They wouldn't clarify how much of a 2D or 3D game Other M is. Those fundamentals were kept secret during our E3 interview with the two men leading the collaboration between Nintendo, Ninja Gaiden development studio Team Ninja and a cut-scene production team led by a Team Ninja collaborator named Mr. Kitaura. That group, dubbed Project M, is creating the 2010 Wii exclusive Metroid Other M that closed Nintendo's E3 2009 press conference. And while we did squeeze out of them that the game wouldn't support MotionPlus or the Wii Balance Board (they knew that was a joke question), Sakamoto and Hayashi were more eager to promote two aspects that Nintendo doesn't often use to sell its games: stylishness and story. "Our goal is to provide the most interesting gameplay and deliver the most cool Metroid ever," Sakamoto said. It should be noted that Sakamoto has one of the most impressive resumes in the industry, so his desire to top past Metroids is a desire to top his own work. Back in the 80s, he did character design for the original Metroid. He directed or supervised most of the games in that series. He also did game design for Nintendo Entertainment System cult classic Kid Icarus and has produced most of the WarioWare games that followed the first of that series. A legacy of Metroid development isn't all it takes to make Other M. In 2006, for all of Sakamoto's credentials, he found that his team of 2D-Metroid developers needed help to develop an idea he had for a Wii Metroid game. He wanted to make a game using 3D graphics. Retro, the Nintendo-owned, Texas-based team responsible for the well-reviewed 3D Metroid Prime games, two of which were out by then, was, curiously, not an option. "Retro has their own approach toward Metroid games," Sakamoto said. "They had their own producer. Their approach to Metroid games has traditionally been the FPA — first person adventure — but my concept was kind of different than that and I was looking for a team that could bring my idea to life." Enter Team Ninja, which, Hayashi said, "is very fond of Samus as a character. We've all got huge soft spots for her." Hayashi, a Team Ninja veteran whose youthful looks could let him pass for the almost-50 Sakamoto's son, most recently directed the well-regarded Ninja Gaiden: Dragon Sword on the Nintendo DS. Interviews about Mario and Zelda games with Nintendo developers typically focus on gameply, but story and character were what Sakamoto wanted to emphasize, noting how the game fits into the timeline between the Super Nintendo's Super Metroid and the Game Boy Advance's Metroid Fusion: "With Fusion, that game was very story-driven. In that game, I believe I was able to explain Samus as a character, as a person, not just somebody in armor. And I was not only explain Samus but the characters around her… with Super Metroid I showed, through her relationship with the baby Metroid, some of her maternal instincts. Between those two stories I feel I was able to explain Samus as a person. But because Metroid equals Samus, I'd like to develop her character further, as a soldier, as a human, also as a woman. That's what they're hoping to do with Other M."
The two developers described the new project as one targeted right at Metroid fans. When I asked if there would be anything in the game for the Wii's expanded audience — say, for my mom — Hayashi said: "When Mr. Sakamoto approached me and my team with the game concept, it was definitely something I and my team felt would be a new challenge for them. Our take on this whole thing is we see the possibility to explore new territory within the Wii system. So we're hoping to create something that will appeal not just to fans of the series but to new users as well." Still, that lack of Balance Board support makes it clear that this Metroid game is unlikely to be going the casual-game route. "Our goal in developing Other M," said Sakamoto, "Is to deliver the kind of Metroid that all fans want to play." Morph ball and ice beam? Of course. Progressions of the character's powers? That's the goal. Said Hayashi: "Metroid has definitely been one of those games where as the player progresses through the story you can really feel yourself powering up. You can really feel Samus evolving in terms of her abilities. I'd like to maintain that essence of the Metroid series. In addition, just the feel of the game, by being in there, the emotional experience for the player is something I feel responsible to maintain true to." It's clear, though, that there will be a twist. The Project M team, Sakamoto said: "Will create a new Metroid unlike anything ever experienced before." And when they're done, he wants them to work together again. Metroid Other M is slated for release next year. Later this summer, Nintendo will release a Wii compilation of Retro's Metroid work, entitled Metroid Prime Trilogy.